If you want to run your own business out of your home, this book will provide you with all the information you need to get started. Learn about the tax and other advantages of running a home-based business. But also be alerted to some of the disadvantages including finding good employees and your legal liabilities. You will learn where to find products or services to sell and how to develop your own products. Then get help in finding out if there is a market for what you have to offer. Take a look at different forms of operating your business from a legal viewpoint and how these could affect your ability to obtain financing. Look at the practical side of handling pick-ups and deliveries. This book will take you on an extensive tour of ways to advertise and market your products or services. It covers direct mail, telemarketing, fax broadcasting, using newspapers and magazines, yellow pages and trade directories. Learn how to decide whether it is worthwhile to participate in trade shows, fairs or flea markets. Then consider some of the aspects of house parties and door-to-door selling. Take a look at permission-based e-mail and e-newsletters and the importance of push versus pull technology. Learn how to create your own Web site. Take a look at some Web authoring software packages. Then find out how to create your own Web store and some of the software that will help you do this. Find out how to let potential customers find you through search engines and how to use Search Engine Optimization (SEO) to your advantage. Find out what’s involved in selling at eBay auctions and how to set up your own eBay store. Finally, consider the financing of your home-based business and whether you can bootstrap your way to success. Chapter 4 - Is there a Market? 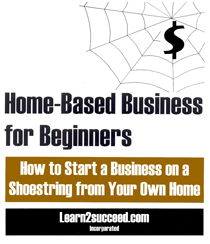 Home-Based Business for Beginners: How to Start a Business on a Shoestring from Your Own Home by: Learn2succeed.com Incorporated: softcover; 156 pages; ISBN: 978-1-55270-353-3; published in 2009; $24.95.